With no current sponsorship secured for a fulltime Nationwide series ride for 2011, Penske Racing president Tim Cindric said the organization would not stand in the way if driver Justin Allgaier is able to secure another ride for next season. “I’d hate to say he was free to go, but there is a mutual respect there,” Cindric told Sirius Satellite Radio’s Claire B. Lang on Wednesday night. “We haven’t been able to put (anything) together yet and we want to see him land on his feet. Allgaier, 24, is in his second full season driving for Penske in the Nationwide Series. He earned his first career win earlier this season at Bristol, Tenn. He is currently fourth in the series standings. How about sending the Chase drivers on tour? 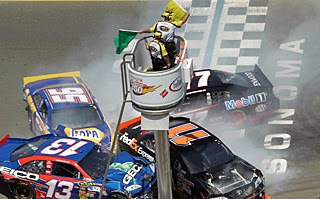 Since NASCAR has already said it is considering making some “tweaks” to its Chase for the Sprint Cup format for 2011, I’ll like to add my own suggestion. After looking over the star-studded media lineup Chase drivers have had in New York City this week – insert sarcasm here – I think it’s time to revamp this whole Chase media blitz as well. When Chase drivers were appearing on shows such as “Late Night with David Letterman” or “Regis and Kelly,” I could see some benefit in the exposure. It could still be considered worthwhile even though the media event was held in a city that doesn’t host a NASCAR race. This year’s media “hit list” for Chase drivers in New York is very underwhelming. For one, there are multiple appearances on ESPN programs and Sirius Satellite Radio. That’s fine, except both are broadcast partners with NASCAR, so it’s not something those entities couldn’t do whether the media event was in New York, Charlotte or Martinsville, Va.
Then there are the appearances on “mainstream media” outlets. You got Kevin Harvick on The Weather Channel. Jeff Burton and Greg Biffle were on something called “The Daily Line” on Versus. And Denny Hamlin was a guest on The CW Morning Show. Well, at least some of the drivers made it on Fox Business Channel. Instead of wasting time on media outlets that have little connection to NASCAR racing, how about sending the Chase drivers on a coordinated multi-market appearance, with at least one driver in each of the 10 markets which host Chase races over the next 10 weeks. You could, you know, help sell tickets to the races in those markets. Perhaps even generate some media exposure in the actual areas where NASCAR races are actually held. It certainly can’t go over any worse than last year’s pie-throwing contest.